No log policy. Affordable price. Smart DNS service. 100+Servers located in 47 countries, 63 locations. ibDNS for persistent streaming. Killswitch and Autoreconnect features. OpenVPN, PPTP, L2TP and SSTP protocol support. ibDNS integrated. High speed and unlimited bandwidth. Proxy support for browser extension and Add-ons. ibVPN only offers only 1-day free trial. There are privacy related concerns attached with its one of the unique features ibDNS. The pricing plans are too complicated and lack the clear understanding for a layman customer. ibVPN scores better in terms of speed, customer support and protocol support. It offers a range of exciting features like high speed, killswitch, support for multiple OS, devices and browsers. However, its ibDNS does consist of privacy issues and probably at least 7-day trial could have been better. ibVPN is a noteworthy invisible VPN solution when it comes to penetrating through geo-blocked content and browse the internet in complete anonymity. ibVPN acts an invisible browsing VPN for more than 500,000 users across 47 countries, connecting through close to 200 servers. It ensures 15-day money back guarantee along with the 24-hour free trial. Its customer support is above par, and regarding security, it stands tall amid topnotch VPN providers. Its compatibility with multiple OS and devices further gives it high-end credibility in the market. Baring few demerits like privacy issues in ibDNS and slightly complicated pricing structure, it is still the best buy for the admirers of online privacy. Where is ibVPN based and when was it started? The Romania based company started their operations back in 2003 by offering their first proxy services and continued their services till 2010 when they finally launched their VPN services. ibVPN is a company with a team composed of 15 internet security enthusiasts with an aim to provide extended anonymity and internet privacy.They are proudly serving a customer base of one million clients with 45,000+ active users from across the globe. 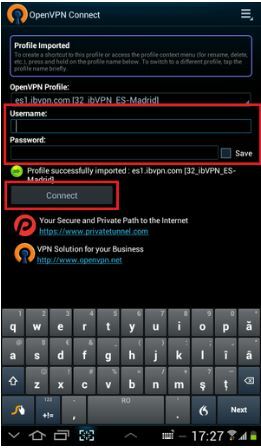 Here is a list of features that are likely to compel you to do ibVPN sign up without giving it a second thought. Having less than 100 servers in the VPN industry would be tough to attract customers as top tier VPNs have more than 200 servers. It’s a n arguable fact that a server is good as the load of IPs that it can offer, ibVPN currently offering more than 2500 IPs. We believe that segregating the customers based on the VPN needs will determine consumers to their server’ sharing ratio. Does ibVPN works with Netflix? – ibVPN Netflix Check? While our circuit testing, we were unable to connect to Netflix US with ibVPN, we tried with other servers, but still couldn’t get through the regional restrictions. Earlier, ibVPN used to slip under the radar but we assume Netflix finally caught up to it. Although ibVPN is a good service, but not very good solution is you are looking for streaming Netflix US. Netflix keep blocking every other VPN at some point, so we are unable to rule out the future possibility of ibVPN out-streaming the popular streaming platforms. Besides, ibVPN also offers 1 gaming server for ardent gamers, 1 ibDNS server, for live streaming lovers and 6 DoubleVPN servers for those who are most concerned for their online anonymity. The invisible VPN provides capable support of OpenVPN – VPN Client, PPTP – a manual setup, L2TP – manual setup, and SSTP – only for Windows and Linux OS. Currently, ibVPn does not support SSL protocol; each protocol is 256-bit for OpenVPN and L2TP and 128-bit for PPTP. The most secure VPN protocol. Automatic installation via All-In-One Client for Windows OS. To install OpenVPN, please follow our Windows, Mac, Android or even DD-WRT tutorials. All necessary config files are included in the installation. Manual setup might take 2 or 3 minutes. PPTP is not as secure as the other three. More secure than PPTP but requires some extra steps when installed manually. Accessible from: Middle East, Arab countries and China! The hardest one to block of all protocols. Only for Windows and Linux OS. The hidden VPN saves you from getting exposed in case of an abrupt network disconnection. Yes, the Kill Switch feature by ibVPN allows you to add applications that require internet to work. In case your VPN connection drops, it closes all the applications included in the Kill Switch application list automatically. This will save your applications to restart on their own when the VPN connects again and hence saves your activity from getting exposed over the web. Currently, you can use feature on your PC and Mac, with the help of All-In-One VPN clients. Does your browsing work require heavy streaming? If yes, then ibDNS or the SmartDNS by ibVPN will be helpful for your cause. The service provider uses advanced technologies and scripting to make the geo-restricted websites believe that you are browsing their content from an uncensored location. Once you are able to bypass the restriction, you get automatically switched to your regular internet connection instead of a third party server such as in the case of VPN. Hence, it does consist of certain privacy related concerns. For example, ibDNS does NOT mask your IP address or encrypt your online traffic. It is in fact a complementary service to ibVPN, meant for the users who want high speed streaming and are least concerned about their privacy over the web. It supports PC/Mac/Android iPhone/iPad/iPod – under certain conditions. PPTP: The protocol sessions for PPTP use Microsoft Point-to-Point Encryption (MPPE), RSA-RC4 for encryption. PPTP runs at 128-bit encryption. L2TP: It undergoes encryption with the help of standardized IPSec protocol and runs at 256-bit protocol. The selection of 3DES or AES encryption algorithm depends on the specification of RFC 4835. OpenVPN: It leverages OpenSSL library to encrypt data and control channels, and uses HMAC authentication for enhances security. It uses AES 256/1024-bit encryption and is extremely secure. SSTP: The VPN tunnel offers a mechanism to transport PPP or L2TP traffic through an SSL 3.0 channel. Used for Windows based SSL VPN, it comes with 256-bit encryption. ibVPN does provide information on the encryption standards of all the VPN types that it offers. However, the invisible VPN is still not clear if the encryption provided by ibVPN also relies on the same standards. The Auto reconnect feature guards the ibVPN connection from unexpected data leaks. Once selected, this option connects you back to ibVPN after you have got disconnected all of a sudden. If you have not checked it, then the software will disable the entire network on your current machine in case of an unwanted disconnection. It complements the VPN perfectly together with Kill Switch and is available for use on PC & Mac via All-In-One VPN Clients. 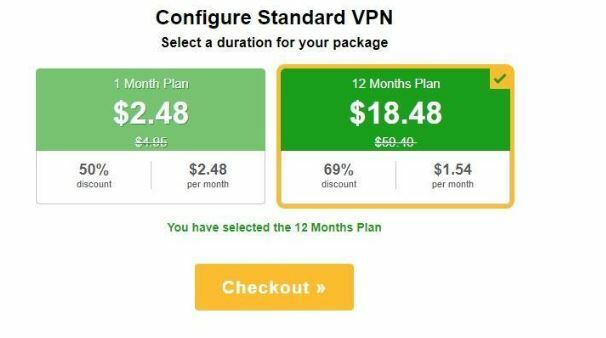 Depending on your budget and browsing requirements, you can choose from among various ibVPN plans. Is there any ibVPN free trial available? As a downside, we believe, 24-hour free trial is too less to enable the users make up their mind to buy this VPM. At least 7-day or 15-day free trial could have been lot better. Still, it scores higher as compared to other invisible VPN providers that do not provide free trials at all. 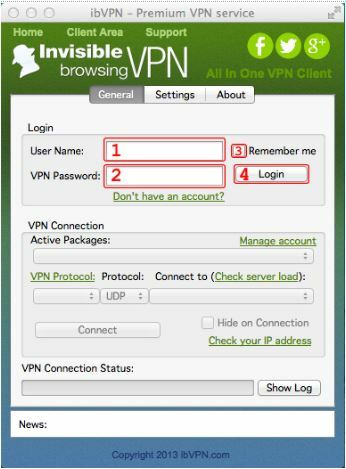 Using ibVPN is simple and is available for a range of devices, OS, add-ons, extensions, etc. All you need is to download its app depending on your device and operating system. Download All-In-One VPN Client for Windows. Open the OpenVPN setup wizard and click “Next“. Note: You can find your Username (email address) and VPN password in the Client Area under “My Details” menu (“Account Information” menu button) in your ibVPN account. Right click OpenVPN GUI and click “Run as administrator“. 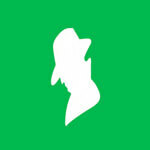 You are all set to invisible browsing on your Windows OS, via ibVPN. Windows 10 will ask to input your VPN Password and Username (email address) after selecting connect. Download ibVPN-.dmg, the OpenVPN user interface for Mac OS. Double click the ibVPN-TunnelBlick.dmg file to open the disk image. DoubleClick the Tunnelblick icon to start the install. Enter your MacOS Username and Password, press OK.
Press Only Me button when asked your choice to install the configuration files for each server. Click OK to install the configurations and then to finish the installation. Click Launch to Start Tunnelblick after the completion of installation. Click Tunnelblick icon on the status bar at the top of your screen to choose from the available server list. Provide your user name and password. You can find your login credentials in the client area under My Details“. Press OK. The ibVPN download is available for mobile devices, and in fact, the ibVPN review writers have given a big thumps up to the mobile apps of the VPN for different devices and OS. Here is a detailed info on how you could use it on your preferred platform. Follow these simple steps to setup OpenVPN app on your Android device. Download VPN connection certificate required to use ibVPN connection using your PC or Mac. Connect your Android device and place this in the root folder File System Root /mnt/sdcard. Open Google Play Store and Install OpenVPN app for android. After successful installation, Tap Open and then Settings icon. Tap Import and then Import Profile from SD card. Choose the preferred ibVPN server, tap Select. Tap connect and then tap Allow to permit the connection certificate. Type “ibvpn” when asked for password. You are now free to connect to your VPN Server and become invisible online. To make sure that you are connected to the chosen VPN Server, you can check your IP address. To start with, it is good to download the ibVPN Client for iOS. Make sure that your Mac or PC has iTunes installed in it, before proceeding. Also, make sure that you open this tutorial from your iPhone or iPad. Download the requisite VPN connection certificate through Safari browser as it enables you to connect ibVPN through OpenVPN app. Tap Install and in the next screen, tap Install again. When prompted for password, type ibvpn, and ignore the Not Trusted message. Tap Next and then tap Done. Download OpenVPN config files to your PC or MAC. Connect your iOS device to your Mac or PC. Press Add button on the right, and select as many servers as you want to import. On your mobile device, start OpenVPN app, downloaded earlier at step 5. Provide your log in details, i.e.User ID (ibVPN VPN username) and Password (ibVPN VPN password) as mentioned in in the Client Area under Account Details. Make sure to slide the Save credentials to ON. Slide the Connection status to ON. This will start the connecting procedure. Consequently, you will get connected to VPN Server. You can check your IP address to make sure that you are properly connected to ibVPN server. Besides PC and mobile device, ibVPN is also available for browser extensions and add-ons from chrome, Mozilla Firefox and so on. It is compatible with any device and keeps you protected from any 3rd party tracking cookies. However, an important point to note here is that the chrome extensions use proxy and not VPN. It also saves you from being tracked from prying sites about which you have no idea. In short, any such extension or add-on enables you to open blocked websites without worrying about censorship, keep you secured from hackers and enable you to browse safely on public Wi-Fi and other networks. Navigate down the page to find Add To Chrome, click it. Alternatively, open ibVPN – Best VPN & Proxy page from Google Chrome store and click Add to Chrome. Double click the file to see a small pop-up in your Firefox tab. Click “Install” and that’s it! Open https://www.ibvpn.com/extensions/ in the browser. Here it is again important to note that the ibVPN extension for Chrome/opera or the Firefox Add-on are only encrypted proxy servers, and not complete VPN. To avail full feature of VPN, the recommended move is to download the requisite apps for Windows, Android, Mac, iOS and more, as already mentioned earlier. What is ibVPN log policy? As per its website, IbVPN does not collect or log any traffic or use of its Virtual Private Network service. The VPN provider can however hand over the requisite information, subject to any legal notice. Otherwise, ibVPN does not share, rent or sell the personal information of the user related to service registration in any situation. This holds for the information collection at ibVPN website as well as for the merchant provider (WHMCS Inc.). In addition, ibVPN uses the facilities of third-party payment providers and does not store the billing information of the clients in its database. It uses AES-256-bit encryption system to secure user information, making it impossible to decrypt. While doing ibVPN review, we also take cognizance of its customer support and found it to be very prompt and helpful. We used the Live Chat support to connect with its team and asked several questions related to the VPN. The concerned person was quick to provide all the answers satisfyingly, which helped us to know in depth about various aspects of the VPN provider. To initiate the chat, you will require providing your name and emailing id, which is a normal practice. For those willing to bypass censorship in order to enjoy their favorite entertainment shows or for people concerned for their privacy, ibVPN is one of the VPN providers. Available at competitive price and accompanying a range of privacy and security features, it boasts of more than 100 servers located across 6 continents, 47 countries and 63 locations, which in itself is quite appreciable. Baring few slight drawbacks like limited free trial, complex pricing structure and insecure ibDNS feature, this multiple device and OS compatible VPN continues to enthrall the ardent security admirers.